Drawstrings come in styles other than scrubs! Men's drawstring pants can look dressy while being comfortable. They are a great option for men to consider for summertime and when on vacation. Scrubs are another type of pants that have a drawstring. Even though they may be extremely comfortable, save them for work. 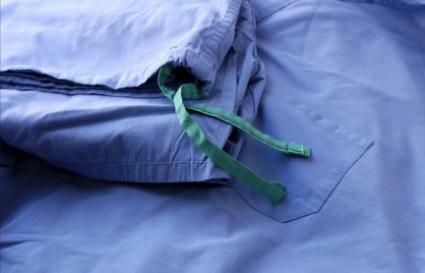 Drawstring scrub pants belong at a hospital or lab, not out in public. Many lounge pants also come with a drawstring waist. These are suitable for lounging at home or while working out. Drawstring pants come in several styles for men. Besides choosing different fabrics, they come in different colors and lengths. White, natural and black are common colors of linen drawstrings. They also come in full length or ankle length styles. Some cargo pants come with a drawstring waist as well. My Cuban Store sells 100% Linen men's drawstring pants. These pants are great to wear for a beach wedding and come in white, ivory or natural. They come in sizes 32-46. Macy's has the Geoffrey Beene Linen Drawstring Pants in black, natural or white. They have a flat front and a zipper fly with a drawstring closure. They also have off-seam pockets and buttoned back pockets. Cubavera Linen Drawstring Pants are sold at Macy's. They are lightweight, comfortable and perfect for summer. They have an elasticized waist with a drawstring closure and also a zip fly. These pants have slant pockets on the hips and come in black, natural or white. Tasso Elba White Linen Drawstring Pants, sold at Macy's, have both a button and zip closure with a drawstring. They have two side pockets and two buttoned-flap pockets in the back. Men's drawstring pants are a great alternative to khakis or shorts. They are comfortable and roomy and are great for the weekends. These pants are not meant to be worn for work or professional meetings so be sure to save them for relaxing and not for the office. White linen drawstring pants look great with tropical shirts or other prints. Natural linen pants can be worn with just about anything in your closet. Try them with a linen shirt for a dressy look or a casual tee for an afternoon lunch. Pair your black drawstring pants with a crisp white button down shirt and a pair of black sandals and you are ready for a dinner out while on vacation. This look can be worn for a casual dinner date or an afternoon outing. When wearing drawstring pants, you do not want to look sloppy. Since this style of pants is more relaxed, go for a more tailored or fitted shirt to look polished. Shirts can be worn either tucked in or out with drawstring pants. If wearing your shirt tucked in, make sure that the drawstring is tied tight and neat. Wear your pants on your natural waistline for the best look. For a twist on the ordinary pair of pants, consider a pair with a drawstring waist. This simple change can add a new look to your wardrobe while providing you a comfortable alternative to the traditional pair of khakis.